Vibration-induced hot spots on the rotor surface generated by friction in fluid bearings (Morton effect), seals or slip rings of electric generators cause spiral vibrations. The spiral refers to the appearance of the vibration in a polar plot. The amplitude of this vibration under certain circumstances can increase to unacceptable levels. The hot spot stability chart reveals dangerous areas of this effect. 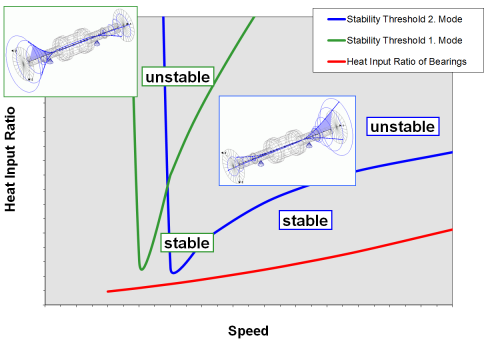 Hot Spot Stability Chart of a pinion. In this case the pinion is stable, because the bearing heat input line is below the stability threshold line.